LABOUR leader Jeremy Corbyn described Philip Hammond’s first Budget as “complacent” — a budget that does little or nothing to address the growing crises threatening the future of our NHS and social services that are making the lives of millions a misery. AROUND one quarter of a million people — according to a police assessment — came from all over Britain to march through the streets of London to defend our National Health Service from cuts and to call for the creeping takeover by the private sector to be reversed. 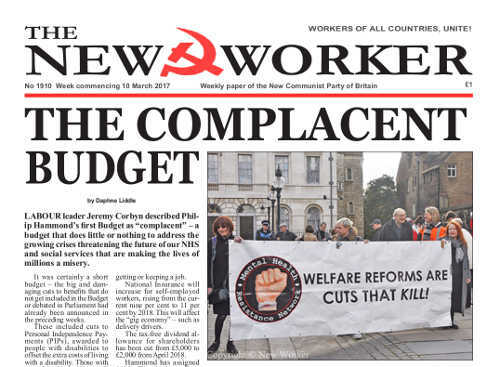 THE DEPARTMENT for Work and Pensions (DWP) recently lost a 13-month legal battle and has been forced to release secret documents illustrating the tactics they use to control and manipulate the media. The documents reveal that the DWP monitors and analyses both mainstream and social media to reduce and manage negative coverage. The documents show the DWP have managed to kill hundreds of stories by making sure that they are not reported on. The DWP had refused to release the reports since the Disability News Service (DNS) originally requested them in September 2015, stating they were “commercially sensitive”.